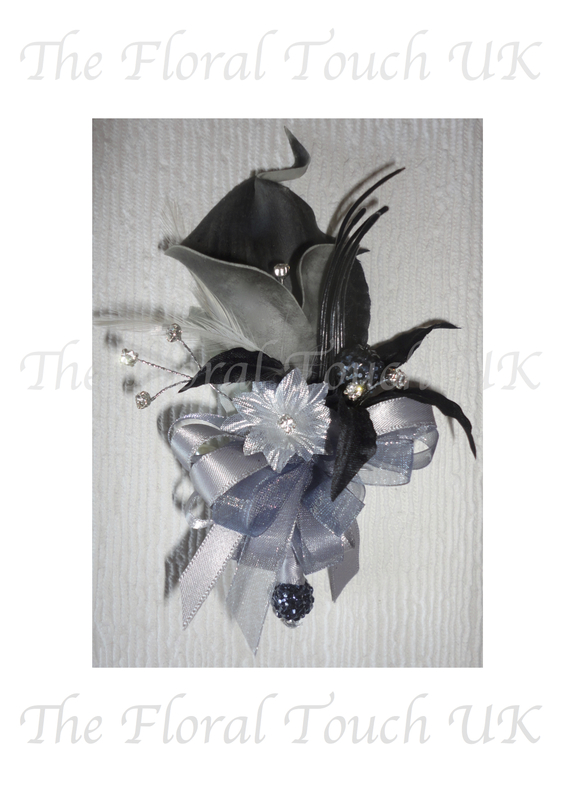 Black, Silver & Grey Corsage - Grey real touch calla lily with black nerine and silver diamante margarita with diamante sprays and beautiful sparkle bead, finished with silver satin & grey organza ribbon with dark gey sparkle bead to base of stem. 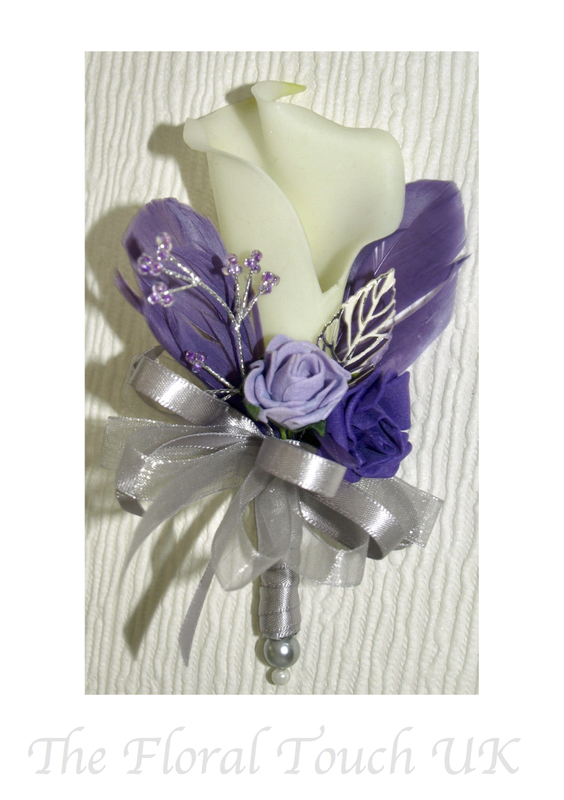 Lilac Calla Lily Corsage - Lilac picasso calla lily with lavender delphinium tiny berry cluster, diamante spray and backed with pale grey sage dusty miller leaf - finished with lilac satin & organza bow. 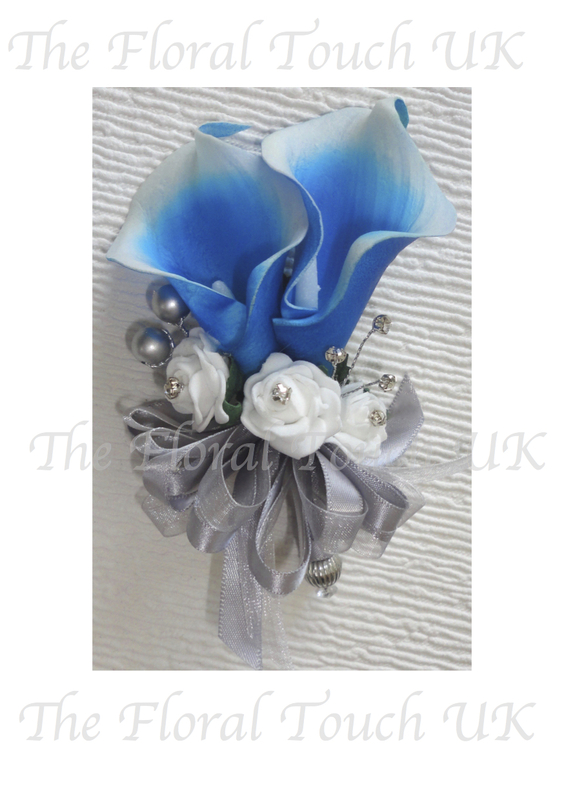 Electric/Cobalt Blue & White Corsage - x2 real touch cobalt blue picasso call lilies with mini white roses, silver pearls & diamantes, finished with silver organza & satin bow and silver embellishment to base of stem. Pale Pink Real Touch Calla Lily Corsage - Real touch pink tipped calla lilies with ivory rose with diamantes sprays & eucalyptus foliage. 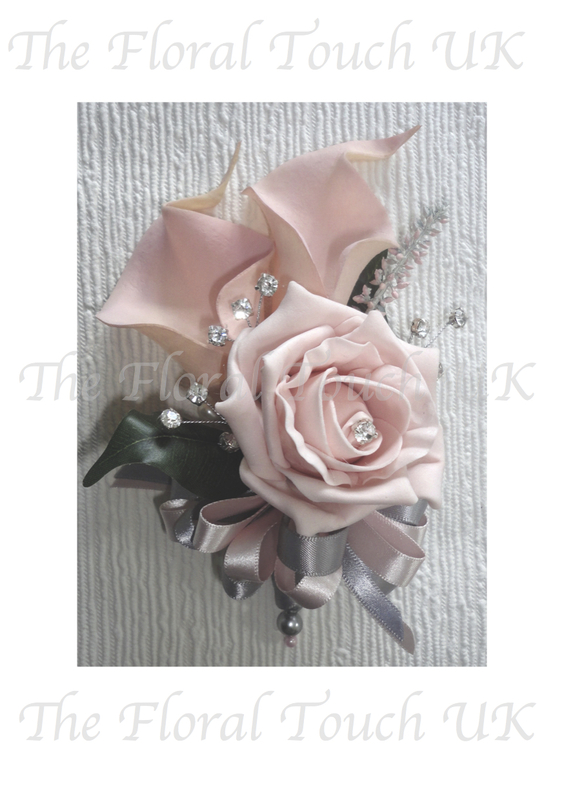 Blush Calla Lily & Rose Corsage - real touch calla lilies with a lifelike polyfoam rose with a sprig of heather and diamante sprays, finished with a silver & blush pink corsage bow. 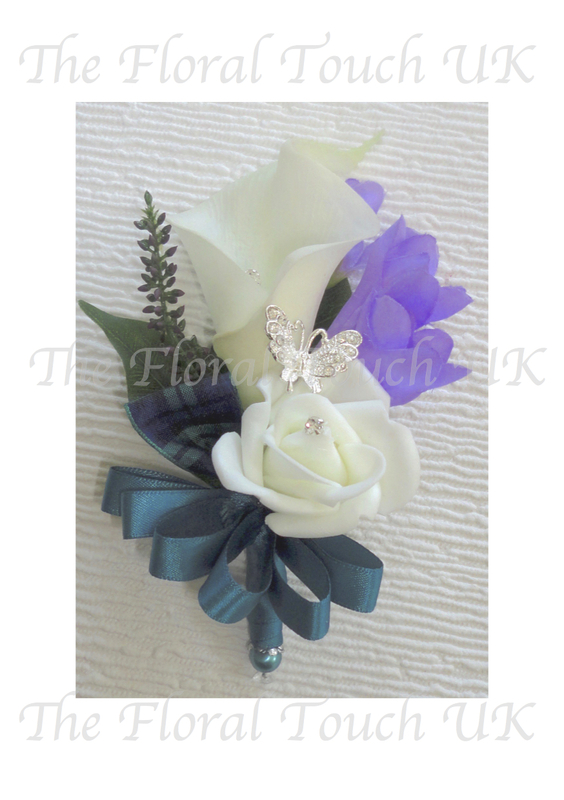 Lavender & Teal Corsage - A real touch calla lily with Lavender freesia, small ivory rose and a sprig of heather with a beautiful diamante butterfly and finished with teal corsage bow and pearl to base of stem. 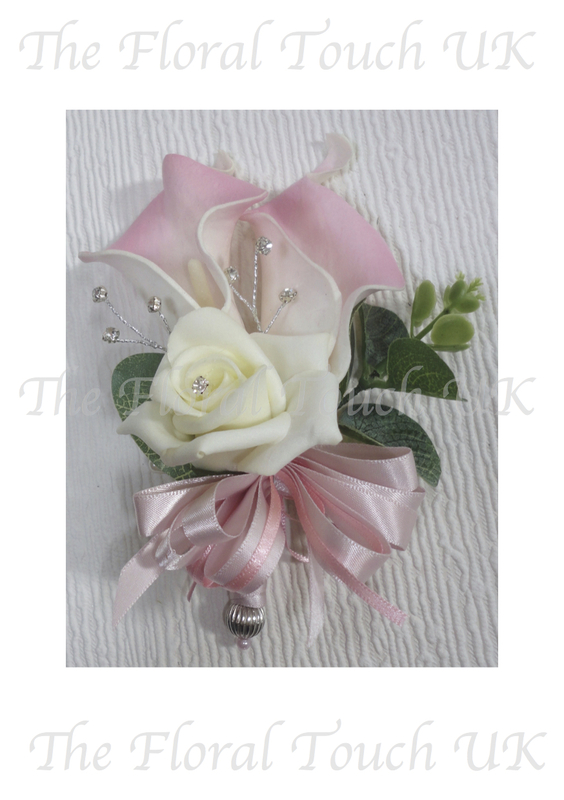 Ivory Calla Lily & Blush Corsage - Beautiful corsage of a real touch calla lily with mini rose buds and a diamante centred silk gardenia with gold crystal beads & mini gold pearl sprays - finished with ivory & blush ribbon & bow. 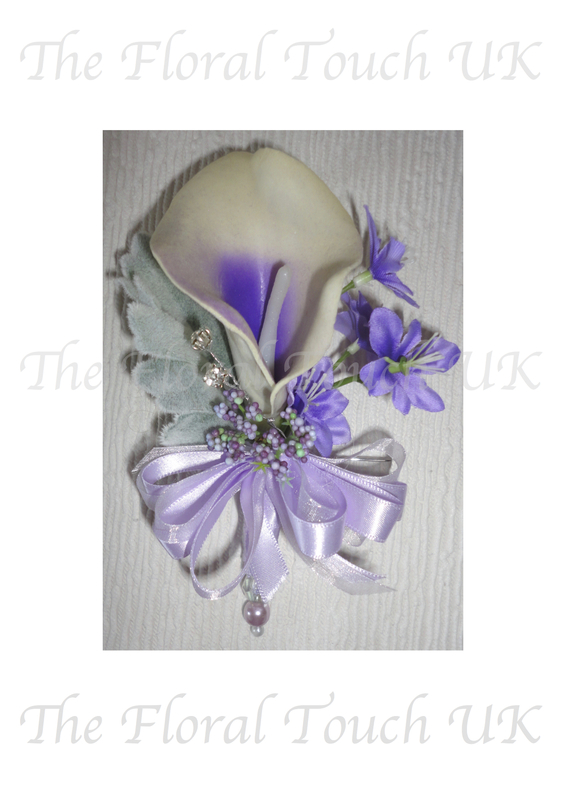 Real Touch Calla Lily With Lilac Feathers - Ivory real touch calla lily with mini lilac & purple roses, lilac feathers and lilac gem spray with silver metal lace leaf - silver satin & organza ribbon bow. 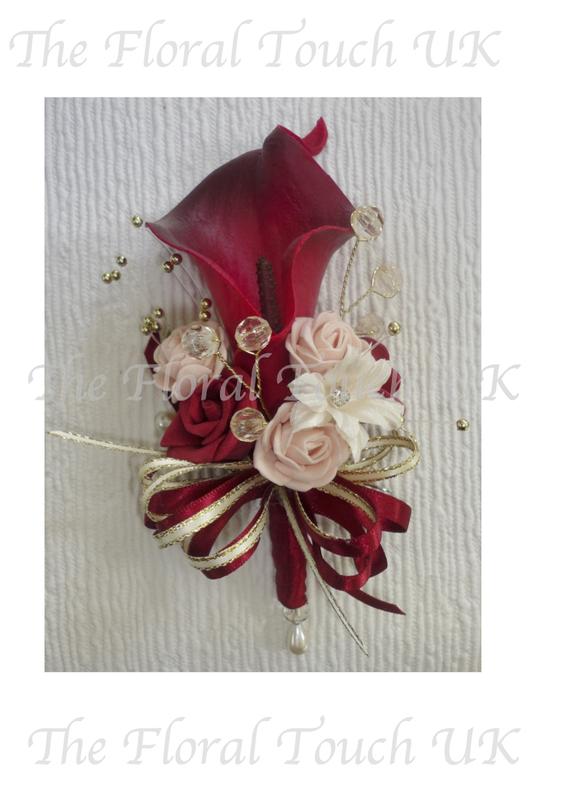 Cherry Red, Gold & Blush Calla Lily Corsage - Cherry red real touch calla lily with mini blush & red roses with a diamante centred silk daisy and gold crystal beads and gold pearls - red & gold edged ribbon bow. 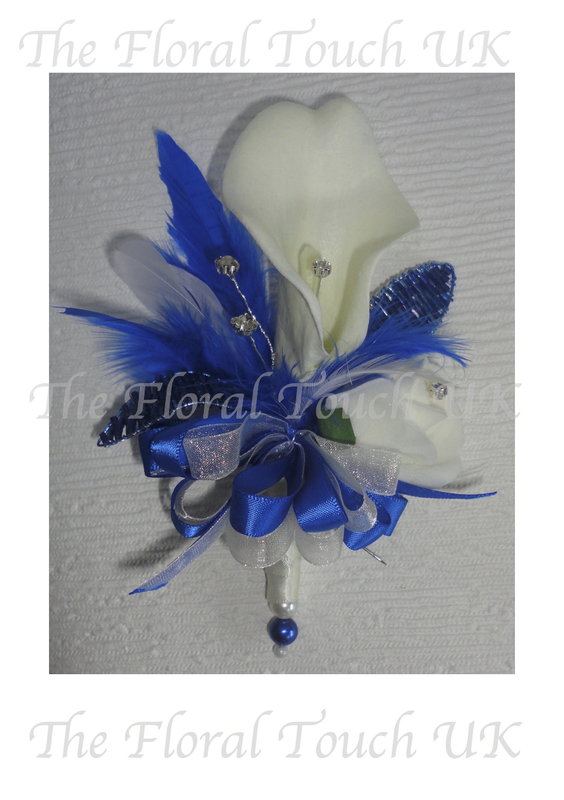 Real Touch Ivory Calla Lily & Royal Blue Feather & Gem Corsage - Ivory real touch calla lily & ivory bud with royal blue & ivory feathers and 2 beautiful royal blue crystal leaves and a diamante spray - stem wrapped in ivory ribbon with bead detail to base of stem - finished with royal blue satin & ivory organza corsage bow. 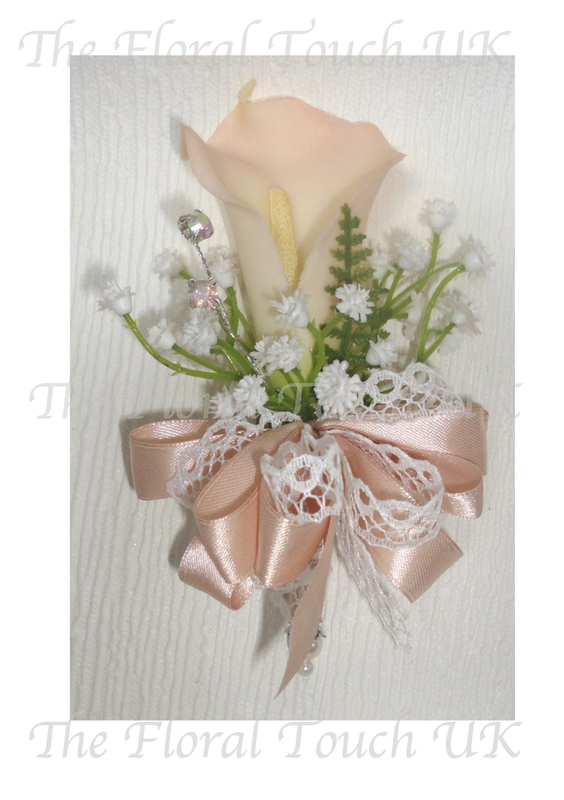 Real Touch Blush Calla Lily & Gypsophila Corsage - Blush real touch calla lily with gypsophila and fern with a sparkling crystal spray and finished with peachblush satin ribbon and lace bow. crystal bead & pearl to base of stem. 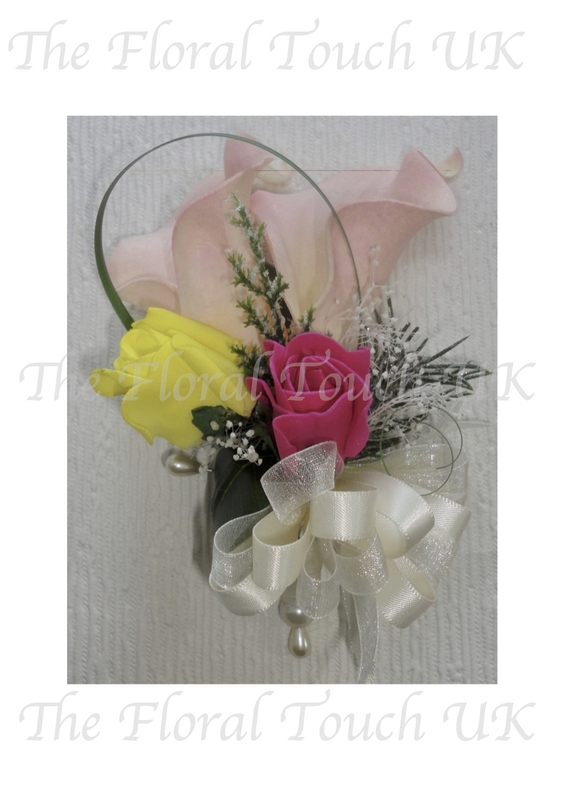 Tropical Corsage - Blush real touch calla lilies with yellow & Fuchsia rose buds fern foliage with gypsophila and finished with satin & organza corsage bow. 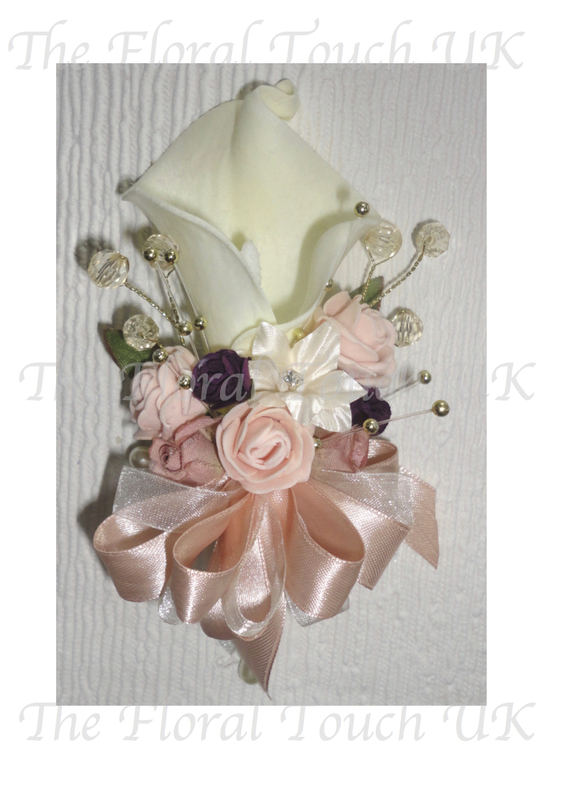 Lilac & Ivory Calla Lily & Rose Corsage - Real touch ivory calla lilies with a lilac rose with diamante to centre and a diamante spray with coiled beargrass and finished with ivory organza bow. 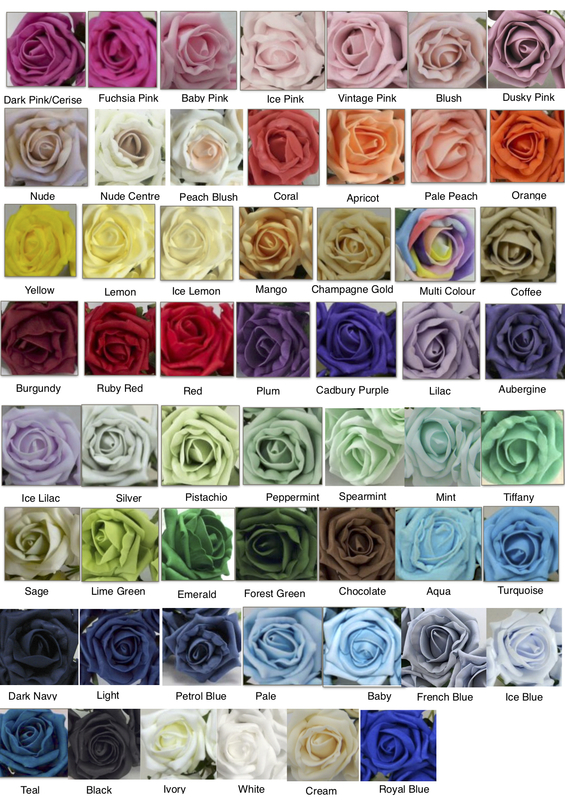 Navy & Fuchsia Corsage - Dark fuchsia Calla lily with with lily of the valley, navy rose bud with diamnte to centre and a fuchsia ranunculus and foliage - stem wrapped in navy blue ribbon with navy satin & organza corsage bow. Designer Aubergine/Dark Plum Calla Lily Corsage - Pearlised plum/aubergine picasso calla lily corsage with beautiful gold brooch with aubergine crystals - stems wrapped in aubergine/dark plum organza with corsage bow - to the base of the stem is crystal diamante bead. 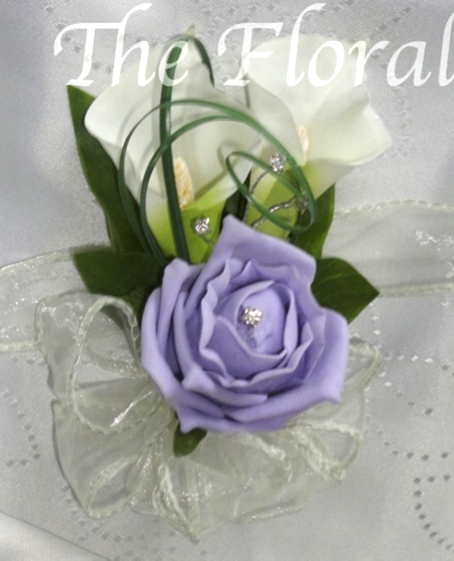 Purple Real Touch Calla Lily With Hydrangea & Lavender -Beautiful corsage consisting of a real touch purple calla lily with lavender and lilac sprays, hydrangea and lilac gems - finished with lilac satin ribbon and purple & lilac corsage bow with a lilac pearl & crystal to base of stem. 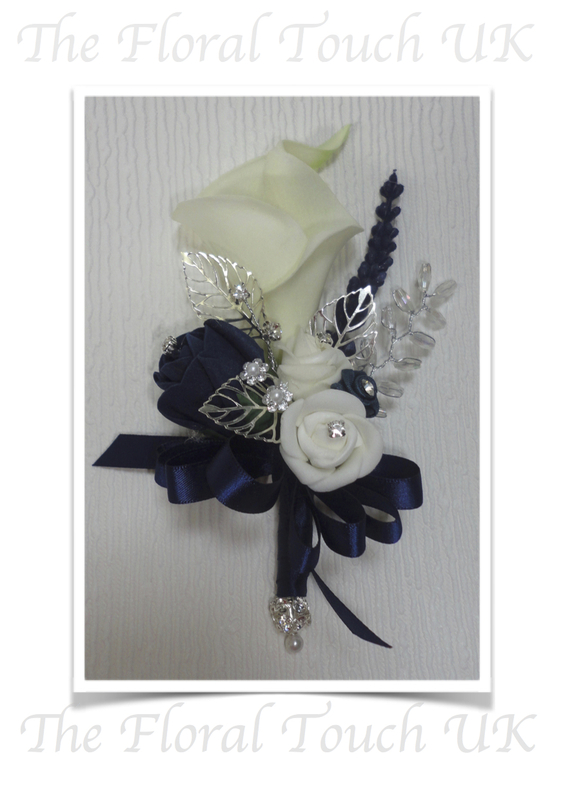 Navy Blue & Ivory Corsage - Single lifelike real touch calla lily with a navy blue rose bud and ivory mini roses with diamantes and a navy blue diamante ribbon rose, tiny pearl & diamante flowers with beautiful silver metal lace leaves - stem is wrapped in navy ribbon with bow and to the base of the stem is a diamante encrusted metal ball finished with a pearl. 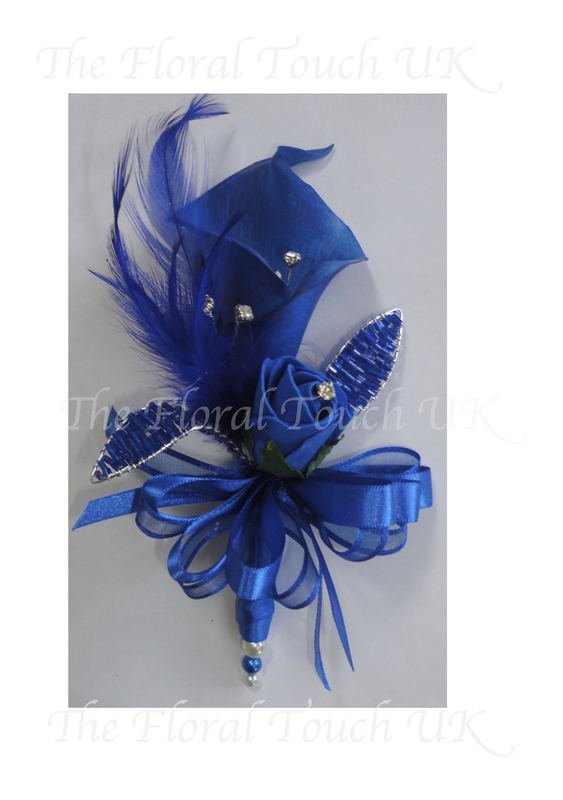 Royal Blue Calla Lily & Feather Corsage - Truly stunning and elegant royal blue calla lily and feather corsage with diamantes and mini silver artificial brunia berries with a beautiful silver metal leaf and mini royal blue roses with diamantes to centres. 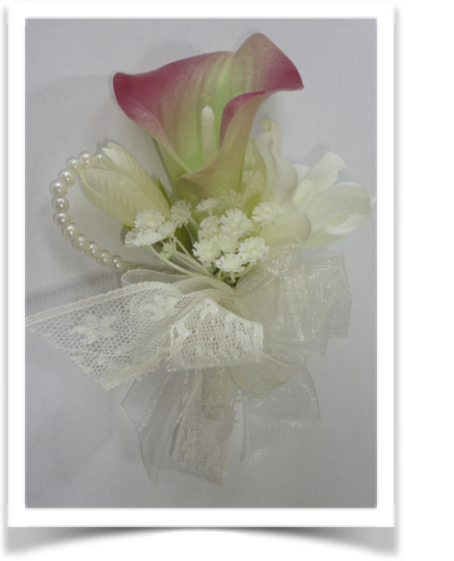 Pink Vintage Style Calla Lily & Lace Corsage - Beautiful vintage style corsage a truly lifelike real touch pink tipped calla lily with freesia & gypsophila and pearls finished with lace & organza bow. 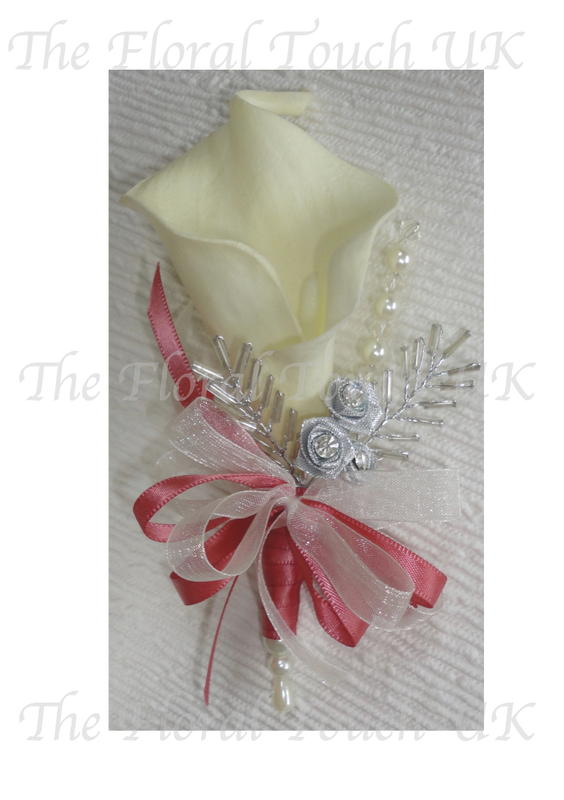 Coral, Silver & Ivory Real touch Calla Lily Corsage - Elegant corsage of an ivory real touch calla lily with a pearl & crystal bead spray, silver crystal fern leaves and silver diamante ribbon roses with ivory & coral corsage bow. 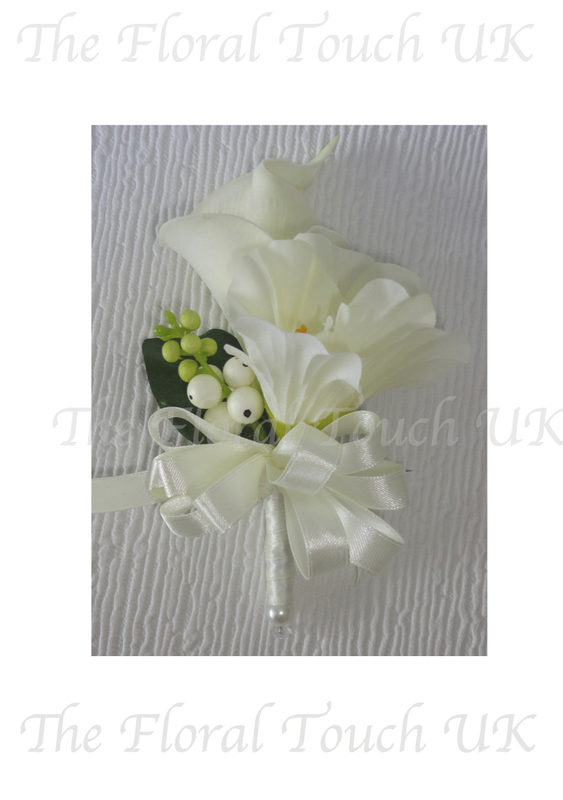 Lime & Ivory Real Touch Calla lily Corsage - Beautiful corsage consisting of 2 real touch calla lilies and an ivory polyfoam rose with foliage and finished with satin edged lime organza ribbon - pearls to base of stem to finish. Mocha & Gold Corsage - Stunning stylishcorsage created using a single real touch cream calla lily with looped mocha & cream variegated beargrass, gold & latte tiny roses with mocha & cream pearl details and beautiful gold diamante chain detail - finished with mocha ribbon and corsage bow with diamante detailing to stem and teardrop pearl to base of stem. 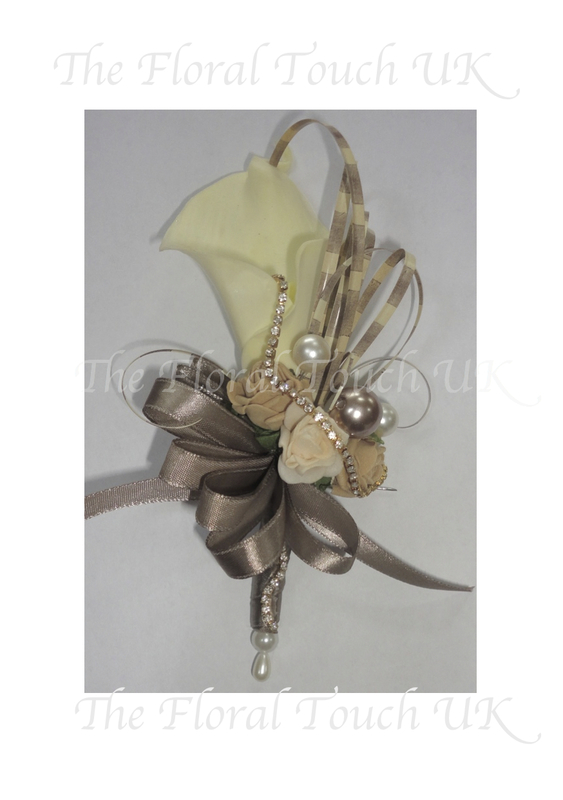 Champagne, Ivory & Gold Corsage - Gorgeous, Ivory Calla lily with champagne pearled babies breath and gold beaded leaf detail with gem spray and finished with a champagne corsage bow and a crystal & pearl teardrop to base of stem. 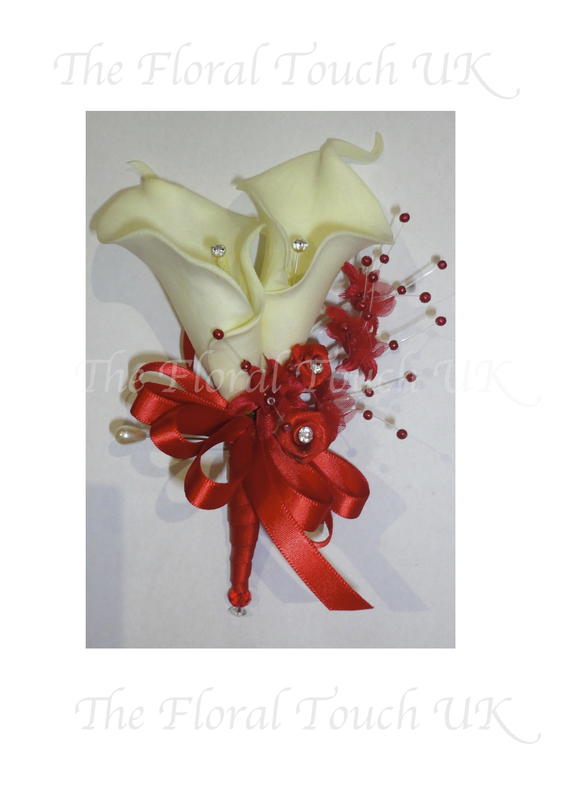 Ivory & Red Calla Lily Corsage - Beautiful real touch Calla lilies with with diamante to centres with red pearled babies breath and red satin diamante ribbon roses - finished with red satin ribbon corsage bow and a red crystal and diamante pin to base of stem. Black & White Corsage With Diamantes & Feathers - Stunning black & white calla lily and rose corsage with diamantes to centre of calla and diamante rhinestone & pearl brooch style embellishment with black feathers and black & white ribbon corsage bow - pearl detail to base of stem. 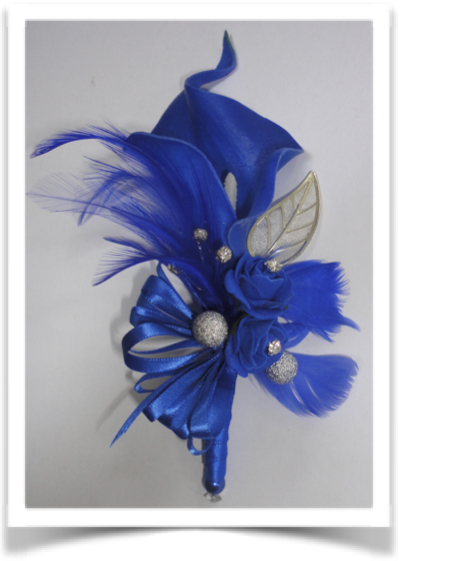 Royal Blue Calla Lily & Feather Corsage - Royal blue Calla lily with diamante feathers, royal blue gem leaves and royal blue diamante studded rose bud - finished with royal blue satin edged organza & satin looped corsage bow. 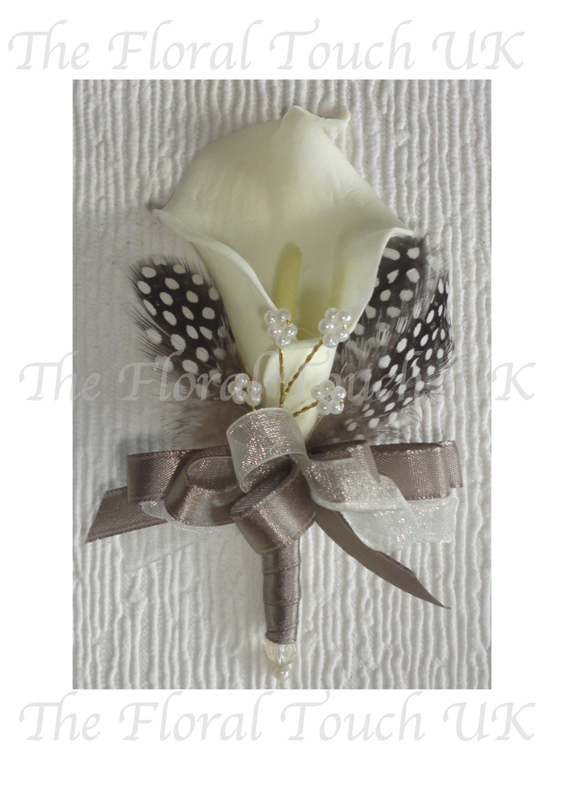 Calla Lily & Feather Corsage - Beautiful and elegant calla lily corsage with feathers and diamante spray, pearls and diamante butterfly embellishment with a silver diamante studded leaf - finished with white satin silver glitz edged ribbon and pearl detail to base of stem. 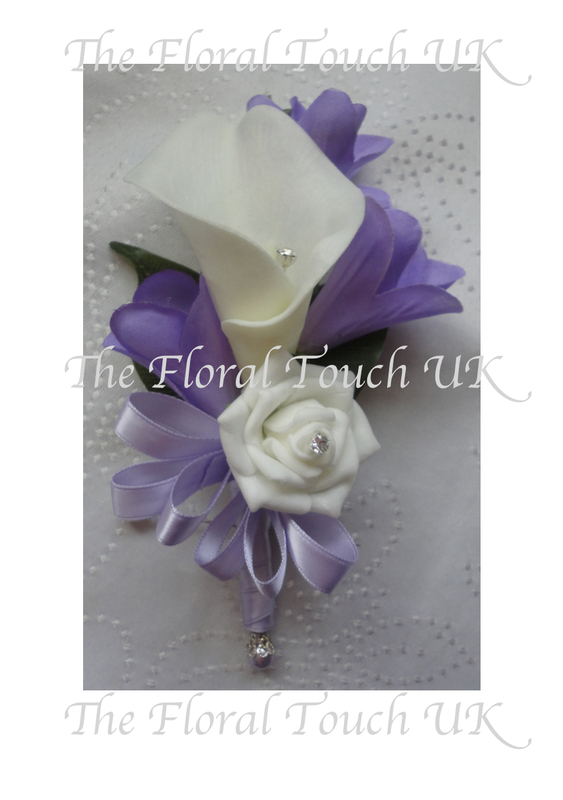 Real Touch Calla Lily with Lilac Freesia - Beautiful Corsage - a single ivory real touch calla lily with an ivory rose both with diamantes to centres and lilac freesia - finishde with lilac satin ribbon to stem and bow - lilac filigree pin to base of stem. 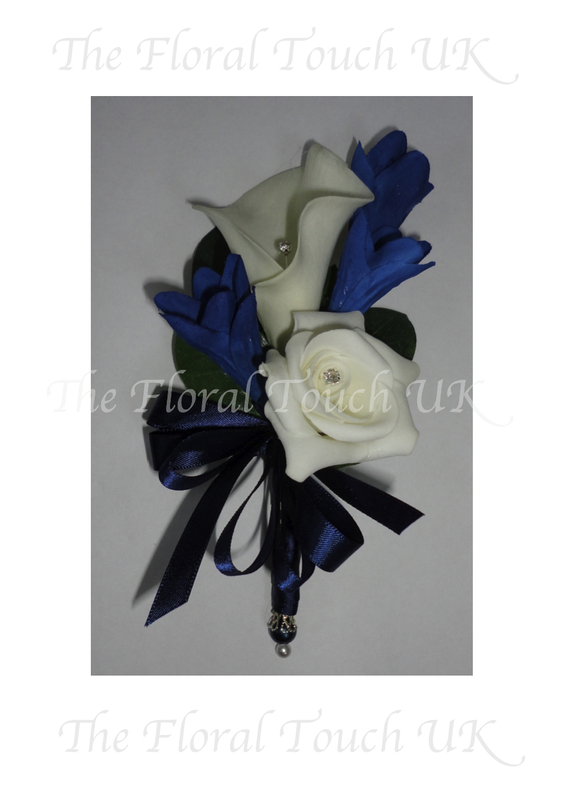 Real Touch Calla Lily with Midnight blue Freesia - Beautiful Corsage - a single ivory real touch calla lily with an ivory rose both with diamantes to centres and midnight blue freesia - finished with navy blue satin ribbon to stem and bow - navy filigree pin to base of stem. Navy Blue & Ivory Real Touch Calla Lily & Rose Corsage - LifelikeIvory real touch calla lily with navy/midnight rose bud with diamante to centre, stephanotis & blue hydrangea with blue leaf spray, backed with asparagus fern leaf and finished with navy blue corsage bow - light navy/midnight & ivory pearl to base of stem. Red & Gold Calla Lily & Stephanotis Corsage - Stunning gold Calla Lily with red nerrine, ivory pearled stephanotis & gold diamante ribbon rose backed with red feathers and finished with red & gold corsage bow - stem wrapped in gold ribbon and trimmed with gold diamantes, with crystal bead to base of stem.